So here's this Gulf Fritillary (Agraulis vanillae) clinging to a lavender stem in our pollinator garden. It is all alone--for a little white. Then here come honey bees seeking to forage on the lavender, too. One bee buzzes next to the butterfly's wing. Then it soars up and over. Too much traffic for this butterfly. It moves to the nearby catmint patch. 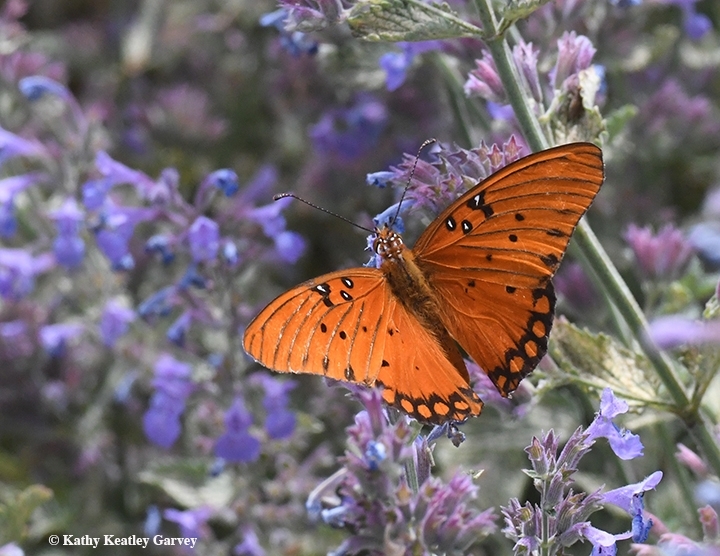 The showy butterfly, a brilliant orange-reddish masterpiece with silver-spangled underwings, first appeared in California in the vicinity of San Diego in the 1870s, according to noted butterfly researcher Art Shapiro, professor of evolution and ecology at the University of California, Davis. He's been monitoring the butterfly populations of central California since 1972 and maintains this website. The Gulf Frit's host plant is the passionflower vine (Passiflora). Plant it and they will come. 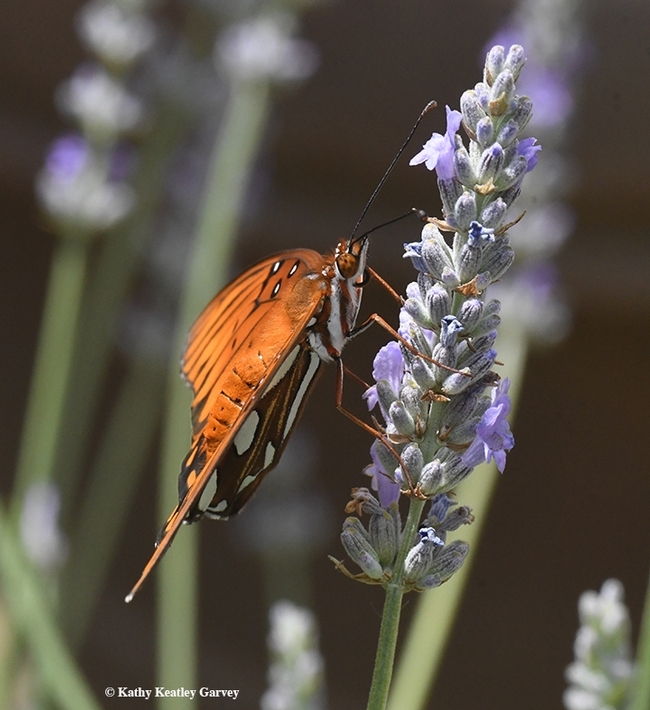 Plant some lavender and catmint, too, for food sources. You'll be rewarded by the joy of seeing these beautiful masterpieces fluttering into your yard. 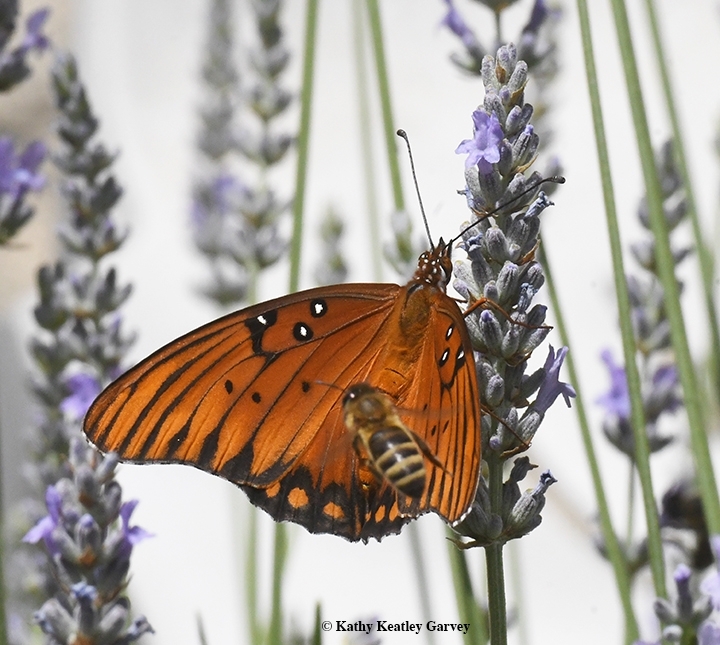 Wonderful photos of the fritillary and good for you for catching the bee as well! 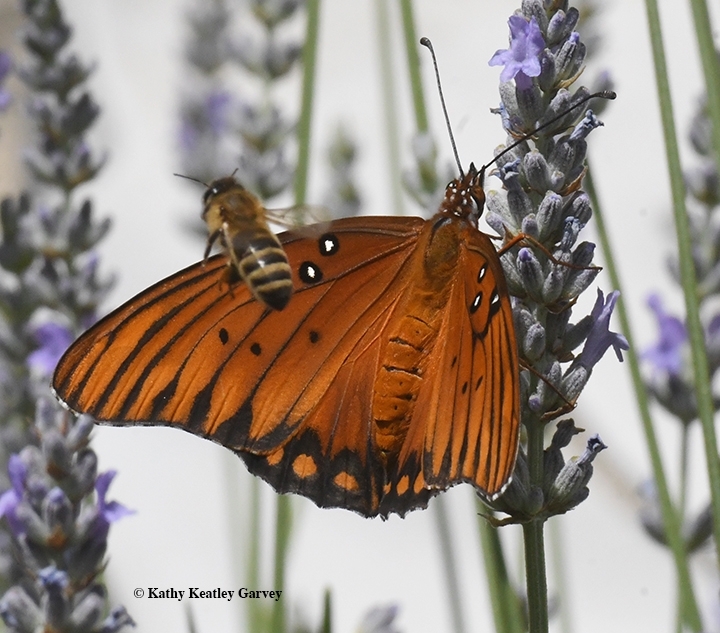 I am still waiting for the fritillary butterflies to arrive here in Texas. My passion vines are in bloom as is the lavendar. And my milkweed is also blooming, but where are the butterflies? Every day I go out in my little cottage garden in hopes of finding one... or two or three, but thus far I am only seeing the hairstreak, cabbage white, admiral, and the painted lady.